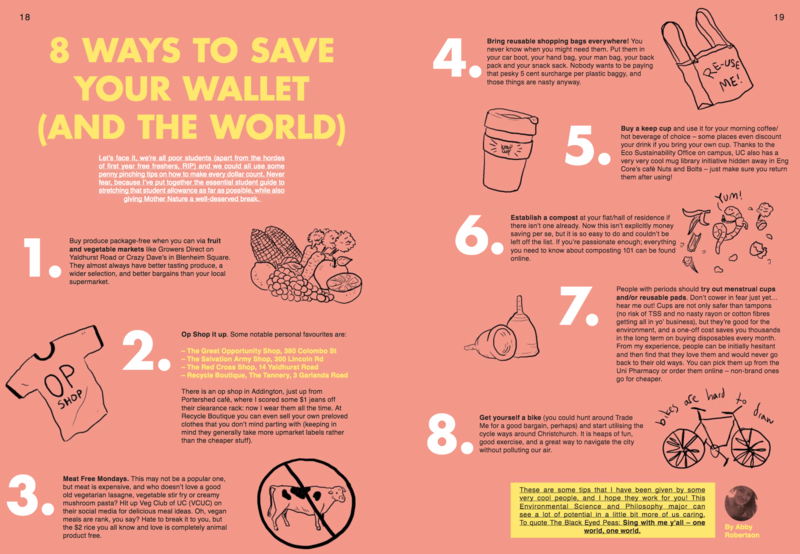 Let’s face it, we’re all poor students (apart from the hordes of first year free freshers, RIP) and we could all use some penny pinching tips on how to make every dollar count. Never fear, because I’ve put together the essential student guide to stretching that student allowance as far as possible, while also giving Mother Nature a well-deserved break. 1. Buy produce package-free when you can via fruit and vegetable markets like Growers Direct on Yaldhurst Road or Crazy Dave’s in Blenheim Square. They almost always have better tasting produce, a wider selection, and better bargains than your local supermarket. There is an op shop in Addington, just up from Portershed café, where I scored some $1 jeans off their clearance rack: now I wear them all the time. At Recycle Boutique you can even sell your own preloved clothes that you don’t mind parting with (keeping in mind they generally take more upmarket labels rather than the cheaper stuff). This may not be a popular one, but meat is expensive, and who doesn’t love a good old vegetarian lasagne, vegetable stir fry or creamy mushroom pasta? Hit up Vegetarian/Vegan Canterbury University Club (VCUC) on their social media for delicious meal ideas. Oh, vegan meals are rank, you say? Hate to break it to you, but the $2 rice you all know and love is completely animal product free. 4. Bring reusable shopping bags everywhere! You never know when you might need them. Put them in your car boot, your hand bag, your man bag, your back pack and your snack sack. Nobody wants to be paying that pesky 5 cent surcharge per plastic baggy, and those things are nasty anyway. 5. Buy a keep cup and use it for your morning coffee/hot beverage of choice – some places even discount your drink if you bring your own cup. Thanks to the Eco Sustainability Office on campus, UC also has a very very cool mug library initiative hidden away in Eng Core’s café Nuts and Bolts – just make sure you return them after using! 6. Establish a compost at your flat/hall of residence if there isn’t one already. Now this isn’t explicitly money saving per se, but it is so easy to do and couldn’t be left off the list. If you’re passionate enough; everything you need to know about composting 101 can be found online. 7. People with periods should try out menstrual cups and/or reusable pads. Don’t cower in fear just yet… hear me out! Cups are not only safer than tampons (no risk of TSS and no nasty rayon or cotton fibres getting all in yo’ business), but they’re good for the environment, and a one-off cost saves you thousands in the long term on buying disposables every month. From my experience, people can be initially hesitant and then find that they love them and would never go back to their old ways. You can pick them up from the Uni Pharmacy or order them online – non-brand ones go for cheaper. 8. Get yourself a bike (you could hunt around Trade Me for a good bargain, perhaps) and start utilising the cycle ways around Christchurch. It is heaps of fun, good exercise, and a great way to navigate the city without polluting our air. These are some tips that I have been given by some very cool people, and I hope they work for you! This Environmental Science and Philosophy major can see a lot of potential in a little bit more of us caring. To quote The Black Eyed Peas: Sing with me y’all – one world, one world.